COOS BAY — Police in Coos Bay, Oregon are investigating an explosion that was set off late last week near a Vietnam veterans war memorial cross that has been at the center of controversy since February. 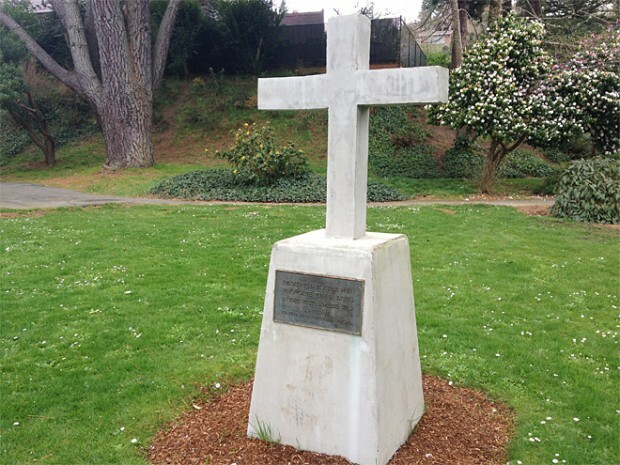 As previously reported, the Freedom From Religion Foundation (FFRF) sent a letter to Coos Bay officials this past spring, stating that the monument displayed in Mingus Park violates the Establishment Clause of the United States Constitution. The organization advised that it received complaints about the display, and was therefore responding on behalf of the unhappy citizens. FFRF continued by outlining that crosses are naturally symbols of Christianity — especially the Latin cross displayed on the monument. “Additionally, the Christian-only memorial sends a message that the government only cares about the deaths of Christian soldiers, not Jewish, other nonChristian and nonreligious soldiers,” the letter contended. FFRF then demanded that the cross be removed swiftly or that the monument be relocated to private property. City officials were to have held a public meeting today about the presence of the cross; however, an explosion at the site late last week turned the matter on its head. According to a news release about the matter, the explosion occurred either late night Thursday or early morning Friday. “[A]n unknown person(s) vandalized the memorial with an improvised explosive device,” police explained. Therefore, the meeting surrounding the cross has been postponed until a later date. The Liberty Institute, a Christian legal organization in Plano, Texas that was summoned by city officials to help defend the cross, said that the incident is telling of where America is headed as a nation. The organization notes, however, that this is not the first time that the cross has been vandalized. In May of this year, an unidentified vandal drew a perforation line at the base of the cross with the word “cut” written above it and an arrow pointing down to the line. The word “remove” was also written in the middle of the cross. But Liberty Institute says that opponents have reached a new low. No suspects have been named in the explosion at this time.